This collection consists of interviews with individuals associated with the Maine Organic Farmers and Gardeners Association and the Common Ground Fair. Themes include the process of beginning to farm organically, the early development of MOFGA and its growth; the Common Ground Fair and its expansion; marketing organic food; farming strategies; raising livestock; and MOFGA’s interactions with conventional farmers and the wider community. The Common Ground Fair in Unity, Maine, in 1999. Shows Steve Green (Maine Folklife Center archivist at the time, with fiddle) and Anu Dudley (sitting). Allen Ray Powell, interviewed by Pauleena MacDougall, September 22, 2002, at the Common Ground Fair in Unity, Maine. Amos Alley, interviewed by Anu Dudley, September 20, 2002, at the Common Ground Fair in Unity, Maine. Anu Dudley, interviewed by Jamie Moreira, September 19, 2003, at the Common Ground Fair in Unity, Maine. Beedy Parker, interviewed by Anu Dudley, September 21, 2002, at the Common Ground Fair in Unity, Maine. Benjamin Wilcox, interviewed by Anu Dudley, September 21, 2003, at the Common Ground Fair in Unity, Maine. Bill Whitman, interviewed by Elizabeth Hedler, September 21, 2001, at the Common Ground Fair in Unity, Maine. Bob Martin, interviewed by Jamie Moreira, September 21, 2002, at the Common Ground Fair in Unity, Maine. Bonnie Rukin Miller, interviewed by Anu Dudley, September 22, 2001, at the Common Ground Fair in Unity, Maine. 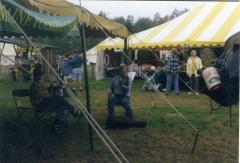 C. R. Lawn, interviewed by Anu Dudley, September 22, 2001, at the Common Ground Fair in Unity, Maine. Cathy Reynolds, interviewed by Anu Dudley, September 21, 2002, at the Common Ground Fair in Unity, Maine. Chaitanya York, interviewed by Anu Dudley, September 21, 2001, at the Common Ground Fair in Unity, Maine. Cynthia Thayer, interviewed by Pauleena MacDougall, September 22, 2000, at the Common Ground Fair in Unity, Maine. Deb Soule, interviewed by Anu Dudley, September 23, 2000 at the Common Ground Fair in Unity, Maine. Donald E. Lipfert, interviewed by Anu Dudley, September 24th, 2004, at the Common Ground Fair in Unity, Maine. Donna Kausen, interviewed by Pamela Dean, September 22, 2000, at the Common Ground Fair in Unity, Maine. Ellis Percy, interviewed by Anu Dudley, September 20, 2002, at the Common Ground Fair in Unity, Maine. Frank Heller, interviewed by Jamie Moreira, September 20, 2003, at the Common Ground Fair in Unity, Maine. Glenn Dewitt, interviewed by James Moreira, September 22, 2002, at the Common Ground Fair in Unity, Maine. Ham Robbins, interviewed by Jamie Moriera, September 22, 2002, at the Common Ground Fair in Unity, Maine. Jean English, interviewed by Anu Dudley, September 21, 2002, Common Ground Fair in Unity, Maine. Jean Hay, interviewed by James Moreira, September 24, 2000 at the Common Ground Fair. Jill Breen, interviewed by Pauleena MacDougall, September 22, 2002, at the Common Ground Fair in Unity, Maine. Joan Lipfert, interviewed by Anu Dudley, September 24, 2004, at the Common Ground Fair in Unity, Maine. Joanna Linden, interviewed by Anu Dudley, September 24, 2004, at the Common Ground Fair in Unity, Maine. John Belding, interviewed by Pamela Dean, September 23, 2001, at the Common Ground Fair in Unity, Maine. Ken Horn, interviewed by Pauleena MacDougall, September 20, 2003, at the Common Ground Fair in Unity, Maine. Marie Hickey, interviewed by Pauleena MacDougall, September 20, 2002, at the Common Ground Fair in Unity, Maine. Matthew Strong, interviewed by Anu Dudley, September 19, 2003, at the Common Ground Fair in Unity, Maine. Mort Mather, interviewed by Pamela Dean, September 22, 2000, at the Common Ground Fair in Unity, Maine. Peggy Heigold Strong, interviewed by Anu Dudley, September 19, 2003, at the Common Ground Fair in Unity, Maine. Photographs from MOFGA Common Ground Fair, 1999-2004. Ralph “Porcupine” Bishop, interviewed by Anu Dudley on September 24, 2004, at the Common Ground Fair in Unity, Maine. Richard Dickey, interviewed by Pauleena MacDougall, September 20, 2002, at the Common Ground Fair in Unity, Maine. Richard Kipp, interviewed by Anu Dudley, September 25th, 2004, at the Common Ground Fair in Unity, Maine. Richard Silliboy, interviewed by Anu Dudley, September 21, 2003, at the Common Ground Fair in Unity, Maine. Rob Johnston, interviewed by Anu Dudley, September 22, 2001, at the Common Ground Fair in Unity, Maine, about Johnny’s Selected Seeds, the company he founded in 1973. Roberta Bailey, interviewed by Elizabeth Hedler, September 23, 2000, at the Common Ground Fair in Unity, Maine. Russell Libby, interviewed by Anu Dudley, September 23, 2001, at the Common Ground Fair in Unity, Maine. Sue Sergeant, interviewed by James Moreira, September 24, 2000, at the Common Ground Fair in Unity, Maine. Susan Belding, interviewed by James Moreira, September 23, 2001, at the Common Ground Fair in Unity, Maine. Susan Pierce, interviewed by Anu Dudley, September 22, 2002, at the Commom Ground Fair, Unity, Maine. Theresa Hoffman, interviewed by Anu Dudley, September 20, 2002, at the Common Ground Fair in Unity, Maine. Tim Nason, interviewed by Anu Dudley, September 20, 2003, at the Common Ground Fair in Unity, Maine. Tom Roberts, interviewed by James Moreira, September 24, 2000, at the Common Ground Fair in Unity, Maine. Wes Daniel, interviewed by Jamie Moreira, September 19, 2003, at the Common Ground Fair in Unity, Maine. Will Bonsell, interviewed by Pauleena MacDougall, September 23, 2000, at the Common Ground Fair in Unity, Maine. Will Brinton, interviewed by Pamela Dean, September 23, 2000, at the Common Ground Fair in Unity, Maine. William “Bill” Thayer and Amanda Caron, interviewed by James Moreira, September 20, 2003, at the Common Ground Fair in Unity, Maine.